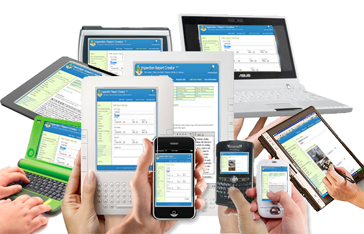 There is a virtually unlimited number of different computers, tablets, and mobile devices that can be used to access the Inspection Report Creator forms online. Any device that is connected to the internet, 3G, or 4G network and has a web browser (Explorer, Firefox, Chrome, Safari, Opera, etc) is capable of accessing the software. Inspection report writing has never been easier. You can use any number of devices you choose. You can use cell phones, Androids, iPhones, iPads, PDAs, Windows Mobile, Blackberries, ultra-mobile PCs, laptops, tablets, and the list goes on and on. One of the neatest things about the software is that no matter what devices you use, they are all automatically synced to the same reports so you can access any report from any device at any time! If you have specific questions about whether a mobile phone or handheld 3G or 4G device that you currently have will work with the online inspection forms, please contact us with the make and model and we'll research the features to assure you it will work. 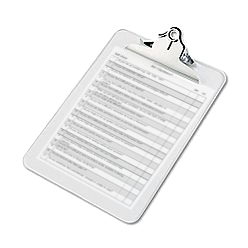 If you don't have a mobile device, you can use the printable checklist in the field and type your inspection data into the software whenever you get back to your home or office computer. The online forms give you the ability to print a customized checklist at any time so you can print a paper checklist to use on the inspection and type your data into the online forms later. Collect your data and enter it later, or use your favorite electronic device to collect on site!